Casio America, Inc. announced the EQS800 as the newest model in its EDIFICE collection of men's watches. Designed under the concept of "speed and intelligence," the EQS800 features a dial made from carbon materials -- the same type of carbon used on the vehicles of top Formula 1® race teams. This timepiece also comes with enhanced solar charging technology to provide consumers with enough energy, so they never miss a beat whether traveling for business or taking a spirited drive down the coast. "The EDIFICE EQS800 is a testament to the advancements in technology we bring to the table with this line of timepieces," said David Johnson, Vice President of Casio's Timepiece Division. "We understand that consumers are looking for high-quality products that meet the challenges of their fast-paced lives and that is what we strive to bring to our EDIFICE line. The EQS800 provides both function and fashion for consumers looking to impress and stay on time." The new EQS800's solar chronograph has enhanced charging technology that can continually store energy via a solar panel located under the inset dials. 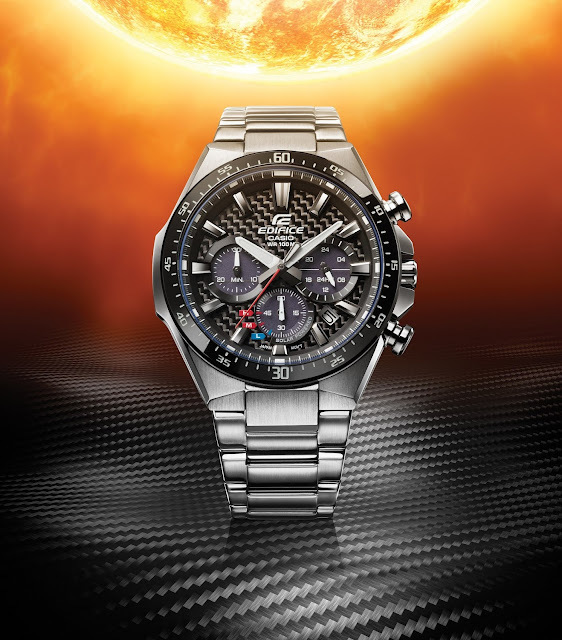 This solar charging technology enables the use of a carbon fiber dial – a first for a Casio solar chronograph. Casio's Solar Power, which consists of a solar panel system that converts light to electricity and eliminates the need for battery changes. It can even be charged in low or fluorescent light. After a full-charge and without further exposure to light, the timepiece has a battery life of approximately five months. Casio has been an official partner of the Scuderia Toro Rosso Formula 1 team since 2016 and the EQS800 showcases innovation derived from a world-class race team. The carbon fiber utilized in this timepiece, as well as the sharp, bold look emulates the materials and design of a Formula 1 race car. The timepiece comes in three models; EQS800CDB-1AV with stainless steel band and black IP bezel; EQS800CBD-1BV with stainless steel band and blue IP bezel; or EQS800CPB-1AV with black resin band and black IP bezel and case. The EQS800 is water resistant up to 100 meters and protected with a scratch resistant mineral crystal. Additional features include a stopwatch, date display, and battery level indicator. Casio's EDIFICE EQS800 is now available nationwide for a MSRP of $170 at select jewelry and watch retailers, as well as ShopCasio. For additional information on Casio's EDIFICE collection of timepieces, please visit www.EDIFICE.Casio.com.